Kyle Gregory Wiltjer (born October 20, 1992) is a Canadian-American professional basketball player for Unicaja of the Liga ACB. He spent two seasons of college basketball with the Kentucky Wildcats before transferring to play with the Gonzaga Bulldogs in 2013. A dual citizen of the U.S. and Canada, he has played for the Canadian national team. Wiltjer attended Jesuit High School in Beaverton, Oregon, where he led the school to three consecutive Oregon state championships. Wiltjer played in the 2011 McDonald's All-American Game in Chicago. He also played in the 2011 Nike Hoop Summit in his hometown of Portland and in the 2011 Jordan Brand Classic in Charlotte. Wiltjer was ranked as the No. 18 recruit in the class of 2011 in the ESPNU 100, the No. 25 recruit by Rivals.com, and the No. 22 recruit by Scout.com. He chose to play basketball for the University of Kentucky Wildcats and coach John Calipari on August 28, 2010. He had also considered Kansas, California, Texas, Gonzaga, Georgia Tech, and Wake Forest. Although he was a 5-star recruit according to all of the recruiting analysts, Kyle Wiltjer never started a game his freshman season at Kentucky, and did not play as many minutes as fellow freshmen Anthony Davis, Michael Kidd-Gilchrist, and Marquis Teague. He averaged only 11.3 MPG and 4.8 PPG, although his 3-point percentage was an impressive 42.5%. 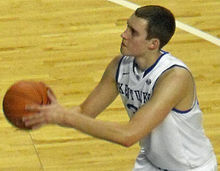 The Kentucky Wildcats won the 2012 NCAA championship during Wiltjer's freshman year. Wiltjer began the 2012–13 season as a starter. In his third game of the season, against Lafayette, he accumulated 23 points, 2 assists, and 4 rebounds. However, he would eventually settle into an off-the-bench role, being named the SEC's Sixth Man of the Year. In April 2013, he had announced he would remain at Kentucky for his junior season. However, he eventually changed his mind, posting a letter on Kentucky's official athletic website on June 23 indicating that he would transfer in order to "compete the way I know I can. ... wherever that may be." A later report indicated that Wiltjer had drawn interest from three of the four Division I programs in his home state of Oregon (Oregon, Oregon State, Portland), Gonzaga, Stanford, and Texas. According to that report, "he left the door open to return to Kentucky if he can't find the right situation." On July 19, multiple media outlets reported that Wiltjer had chosen Gonzaga. The transfer became official the next day, when Gonzaga received a signed copy of a financial aid agreement. After sitting out the 2013–14 season due to NCAA transfer rules, he had two remaining seasons of eligibility. In February 2015 he scored a career-high 45 points against Pacific. Wiltjer led Gonzaga to its second ever Elite Eight appearance and a school record 35-3 record. He was named a Consensus Second-Team All-American, as well as First-Team All-WCC and WCC Newcomer of the Year. In his first season with Gonzaga he appeared in 38 games averaging 16.8 points per game, 6.2 rebounds per game and 1.9 assists per game in 27.6 minutes per game. After contemplating forgoing his remaining eligibility to enter the 2015 NBA draft, WIltjer decided to return to Gonzaga for his senior year. Entering his second season with Gonzaga, Wiltjer was named CBS Sports' preseason player of the year. Sports Illustrated projected Wiltjer as the preseason player of the year, scoring champion, and the top-usage player in all of NCAA Division 1 basketball. He was named to the 35-man midseason watchlist for the Naismith Trophy on February 11. After going undrafted in the 2016 NBA draft, Wiltjer joined the Houston Rockets for the 2016 NBA Summer League. On September 23, 2016, he signed with the Rockets. Wiltjer appeared in four of the Rockets' first 25 games of the 2016–17 season, scoring a total of three points. On December 14, 2016, he scored a season-high seven points in a 132–98 win over the Sacramento Kings. During his rookie season, Wiltjer had multiple assignments with the Rio Grande Valley Vipers, the Rockets' D-League affiliate. On June 28, 2017, the Los Angeles Clippers acquired Wiltjer, Patrick Beverley, Sam Dekker, Montrezl Harrell, Darrun Hilliard, DeAndre Liggins, Lou Williams and a 2018 Top 3 Protected first-round pick (which ended up being pick #30) from the Houston Rockets in exchange for Chris Paul. He was later waived by the Clippers on July 15, 2017. On August 15, 2017, Wiltjer signed with the Toronto Raptors. On October 7 he was waived by the Raptors. On October 21, he signed with the Toronto Raptors' NBA G League affiliate, the Raptors 905. On October 29, 2017, Wiltjer signed with Olympiacos Piraeus of the Greek Basket League and the EuroLeague. On July 3, 2018, Wiltjer signed a one-year deal with Unicaja of the Liga ACB. As a member of the Canadian Under-18 junior national team, Wilter won a bronze medal at the 2010 FIBA Americas Under-18 Championship. As a member of the Canadian university national team, he played at the 2013 World University Games. With the senior Canadian national basketball team, Wiltjer played at the 2015 Pan American Games, where he won a silver medal. Wiltjer's father, Greg, is a former Canadian professional basketball player. His paternal half-sister and Greg's daughter, Jordan Adams, is also a former professional player. Both Greg and Adams also represented Canada. ^ Graves, Gary (June 23, 2013). "Kentucky F Kyle Wiltjer says he is transferring". CollegeBasketball.ap.org. Associated Press. Retrieved June 23, 2013. ^ "Kyle Wiltjer may transfer from UK". ESPN.com. June 25, 2013. Retrieved June 25, 2013. ^ Goodman, Jeff (July 19, 2013). "Sources: Kyle Wiltjer to Gonzaga". ESPN.com. Retrieved July 20, 2013. ^ Borzello, Jeff (July 19, 2013). "Kentucky transfer Kyle Wiltjer headed to Gonzaga". CBSSports.com. Retrieved July 20, 2013. ^ "Wiltjer's has career-high 45, No. 2 Gonzaga beats Pacific". USAToday.com. February 20, 2015. Retrieved February 20, 2015. ^ a b c "WCC Announces 2015 Men's Basketball All-Conference Team". WCCSports.com. March 3, 2015. Retrieved March 3, 2015. ^ "Kyle Wiltjer player profile". ESPN.com. Retrieved March 29, 2015. ^ Vecenie, Sam (April 20, 2015). "Gonzaga forward Kyle Wiltjer returning for senior season". CBSSports.com. Retrieved April 20, 2015. ^ Parrish, Gary (October 6, 2015). "Gonzaga senior Kyle Wiltjer is CBS Sports' Preseason Player of Year". CBSSports.com. Retrieved October 6, 2015. ^ Winn, Luke (October 13, 2015). "Player of the Year projections: Wiltjer, Simmons a cut above competition". SI.com. Retrieved October 14, 2015. ^ Payne, Terrence (February 11, 2016). "Naismith Trophy midseason list announced". FoxSports.com. Retrieved February 19, 2016. ^ "Rockets to Compete in Samsung NBA Summer League 2016". NBA.com. July 1, 2016. Retrieved December 8, 2016. ^ "Rockets Announce Training Camp Roster". NBA.com. September 23, 2016. Retrieved September 23, 2016. ^ "Kyle Wiltjer 2016-17 Game Log". Basketball-Reference.com. Retrieved December 22, 2016. ^ "2016-17 NBA Assignments". NBA.com. Retrieved December 8, 2016. ^ "Press Release: L.A. Clippers Acquire Seven Players and Draft Pick, Including Beverley, Dekker, Harrell and Williams". NBA.com. June 28, 2017. Retrieved June 28, 2017. ^ Charania, Shams (July 15, 2017). "Clippers Waive Kyle Wiltjer". RealGM.com. Retrieved July 15, 2017. ^ "Raptors Sign Kyle Wiltjer". NBA.com. August 15, 2017. Retrieved August 15, 2017. ^ "Raptors waive Rautins, Meeks, Wiltjer". Toronto Star. October 7, 2017. Retrieved October 7, 2017. ^ "Raptors' Kyle Wiltjer: Signs with Raptors' G-League affiliate". CBSSports.com. October 21, 2017. Retrieved October 30, 2017. ^ Olympiacos signs big man Wiltjer. ^ "Συμφώνησε με Γουίλτζερ ο Θρύλος". Olympiacos BC (in Greek). October 29, 2017. Retrieved October 30, 2017. ^ "Wiltjer, first singning of Unicaja / Web Oficial del Unicaja Baloncesto". www.unicajabaloncesto.com. July 3, 2018. Retrieved July 4, 2018. ^ Kyle Gregory WILTJER (CAN). ^ "USBWA names 2014-15 All-Americans". SportsWriters.net. Retrieved March 16, 2015. ^ "Kyle Wiltjer Bio". GoZags.com. Retrieved June 28, 2017. ^ "Lobos Center Jordan Adams Selected In 2003 WNBA Draft". Golobos.com. University of New Mexico. April 25, 2003. ^ "Gregory Hilko WILTJER (CAN)". FIBA. ^ "Jordan Adams Smith". Golobos.com. University of New Mexico. November 27, 2012.